Kuckleheads in the news, Model Employee! Music from, Eric Clapton, Beastie Boys, Dr. Dre, Aerosmith, AC/DC, B-52s and More! 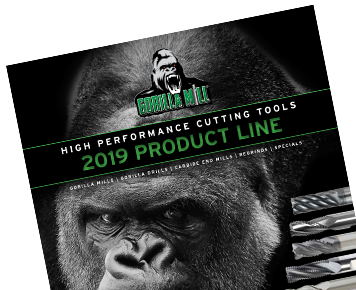 Product Spotlight, CGC Calculator, Gorilla Gear, Gorilla Drills. Kuckleheads in the news, Lucky Goat Nards! Music from, Ozzie, Molly Hatchet, Metallica, The Eagles, James Gang and More! Product Spotlight, Silverback Knuckledragger for hogging aluminum, 3 flute Silverback for non-ferrous materials. Music from, Chili Peppers, Nirvana, Ratt, Guns and Roses and more! Gorilla Radio Hour 1 is in the can! Tips and techniques about the Gorilla Mill lines. Un-edited music tracks from well-known artists, knuckleheads in the news and the chance for you to be heard. Though many more hours are being produced for Gorilla Radio, the first hour is complete and now available. Enjoy! CGC broadcasts music in Its un-edited form, some offensive language may be found within the music lyrics.